Protect Adsense Account From Invalid Clicks.Here rises the biggest problem of all which is nothing less than a nightmare to Google and its brothers and sisters. Do you know your Adsense Account is in danger, yeah this is not an April fool prank or anything like a joke, this is as true as you are breathing from some past days many bloggers experiencing heavy invalid activity in their Adsense account. 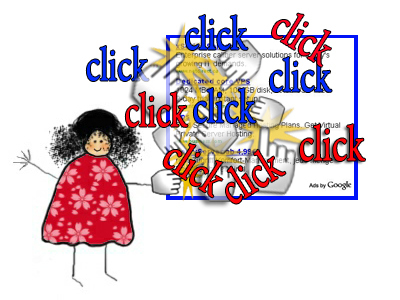 You may have also experienced that number of clicks are much more than as comparison of the Estimated Earnings, especially from some countries like United states clicks are coming fluently but no money, CPC from such countries lies somewhere between $0.01 – $0.04 which is too less and this Cost per Click clearly saying that these clicks you are getting on your Ads are not Genuine for sure. Many Bloggers and Webmasters have lost their Adsense Ads in some past days because of this invalid activity or some other reasons. 1. If you google, you can find few “so-called” companies charges you about 5$ to click ads in your site for the whole month. 2. There are like thousand facebook page in which bloggers like these makes friends with other bloggers like him/her who wants to make money in adsense and asking each other to click ads. 3. there are few scripts being sold in the dark market that clicks ads automatically with different ip’s and timings. 5. Find invalid clicks are coming from. Log in to your Adsense Account –> Click on Overview this month.–>Select the Today date from the upper right corner.–>Now click on Countries from Left sidebar. Now carefully checkout the no. of clicks in front of each Country name. If you detect any country from where clicks have been done but CPC from there are very low then it simply means that your Adsense Ads are in danger. seriously, if you are in Google’s position you will be scratching your head to death. They do have few tricks in their bag to save the day, that involves a highly trained technical nerds along with few powerful scripts and algorithms that can smell a fraud click/invalid click in a second. And still this is not our problem, because we are genuine and decent publishers who don’t want to steal anyone’s money. Then what is the need of this article ? Since they have a way to detect problem but that particular way do have a problem. These tools are not smart enough and just like any other tool they do have a flaws. Sometimes Google has to deny a decent click reliving that they came from bad network or the same IP address or bad traffic. This could be much worse, some times people who are jealous in your growth will click your ads so that you may get banned or your account will be terminated permanently. To avoid these problems The team has a made few changes in their approach that may help you, here is a video presentation based on this issue..
Not a year ago, they use to terminate such account blind folded when they find your account is being used illegal. But now Google will go through your past records and activities including what you search for to verify whether this happened accidentally or wantedly. So instead of terminating your account they will suspend you, giving a chance to prove yourself as innocent, if so. Google will be in touch with you every time when they find something so wrong with your account, They will provide you with all the details you required to explain yourself or resolve the problem. So always check your inbox for emails from adsense. Since they just suspend your account, there is still hope for you to activate your account if there is a problem or if you got suspended for something you haven’t done. There is a form in your adsense account to file a reconsideration request along with what went wrong and how you are not involved in this issue. If you do have a problem in filing a reconsideration request, i want you to read this article. I lost my Adsense Account due to invalid activity on my account, what to do ? When Google takes adsense away then they always mentions the reason behind it, so you need to ensure that it will not happen again in future and after that you can fill Appeal form provided by the Google to claim your Adsense account back, but don’t go for appeal form in hurry first of all you must take care of point they mentioned in their mail. I filled Appeal form, will I get Adsense back ? Well nobody can say Yes for this question, it’s all depend on Google, if they realize that you have done good business with them in previous time then there are some hope you will get your Adsense back, but not sure for anyone. I filled Appeal form but no reply, what to do ? You cannot do anything for this, all we can do is that we can fill Appeal form then Google will reply you back after taking their time, sometimes they takes 2-3 days for reply back. When I applied for Adsense back by `Appeal form` they rejected again, now what. This is sad but ! even after they refused to give your adsense back to you, if you work on your blog continously for some months and you write valuable and original content then there are chances to have Adsense again on your blog, one of my friend have experienced it. Even after many try Google isn’t giving me Adsense back, now what to do ? In this annoying situation you have some other ways to get income from your blog for that you can check this `Ways to Make Money without Adsense`. If you don’t wanna go for it then you can think of another idea which is, you make another blog then apply for Adsense for that new blog and when you get Adsense for it you can use that Adsense account Ads on your both blogs the new one and old too. Is it as Easy as it Seems to Make Money with Google AdSense?